Wojciech Pacula: Please tell us about yourself and your company. My brother (Arnaud) and I (Laurent) were immersed in technology, audio and music from a very young age. I got my hands on (and inside) the only computer in the company when I was 10 years old and built my first audio equipment from scratch at about 14. It was a guitar preamplifier, as my brother got on playing the guitar. As teenagers we designed and built a large sound system and did quite a few sound reinforcement services for concerts. Naturally my brother and I did scientific studies and graduated in mechanical engineering and electronic engineering respectively. I joined JMF Audio in 2004 after I designed my first DAC in 2003, which probably was the first 768kHz DAC ever built. When did you start thinking about a hi-res player? > We thought of designing a transport in 2006 already. At that time people requested SACD support. Ideas made their ways as we had more and more opportunities to discover, listen, evaluate existing products at clients places. In around 2012, I thought the time was right for developing a transport. We evaluated several disc mechanisms, CD only, CD/SACD, several computer based audiophile servers and mastering studio solutions via USB, SD card readers... Then we discovered the new Blu-ray Pure Audio format, with quite a few releases already available. I thought this was the format we had been waiting for: high definition, physical media, no computer fuss. The first evaluation was made with Blu-ray from Jan Gunnar Hoff "Living" 2L. It showed great potential. From our earlier evaluations, we knew we could get a more desirable sound with a spinning disc, so I figured we had to support this format while enhancing CDs and SACDs, thus to design the dream transport as the last product to complete the JMF Audio line. Do you really think that physical disc has a future in a "streaming" world? > I think streaming is here to stay, especially for the mass market. But in my opinion many music lovers enjoy getting back home and listen to music to relax. Many of us have stressful jobs, some spend all day on computers and smartphones. Browsing a disc collection, touching the packages, selecting the disc depending on one's mood, placing the disc on the player, sitting down and reading the booklet ; all this represent an essential part of the pleasure of listening to one's favorite artists' music. The real thing, easy. Somehow, I think that the revival for vinyl is an answer to the fashionable streaming attitude... However this is philosophy. The physical media has to prove superior rendering quality or it makes only little sense for the absolute sound seekers to keep on playing discs. What is the upside of BD Audio disc vs streaming/files? > As said earlier and as explained on the web site ( http://jmf-audio.com/dmt37_en.htm ), discs played with the DMT 3.7 sound more natural, more ample and fluid than the files versions on whichever machine. The result is just desirable. Moreover with Blu-ray Pure Audio discs that comply with the msm-studios standard (registered by the AES - Audio Engineering Society), a Blu-ray Pure Audio means a package including a CD (SACD) for versatility, a playable Blu-ray Pure Audio with high resolution stereo and surround audio content plus mShuttle. mShuttle is a technology that gives easy access to file versions residing on the Blu-ray disc (no internet access, source guaranteed). The content depends on the producers' and record companies choices. So the music lovers have all in one package. The dream digital audio package. Your disc mechanism is unique - is it your own design? What was the starting point? > BDPM1 is a JMF Audio proprietary mechanism. The world first machined SACD / Blu-ray mechanism. At first we wished to design a transport in the same case as the DXC2.2 MKII converter, so that it could be placed on a shelve and be relatively affordable. As we worked on vibration analysis and their influence on sound quality, it became obvious that if we wanted to build a highly superior sound quality transport, we had to seriously study the mechanical aspects, as if it were a vinyl record player. Next we eliminated all tray/moving loader mechanisms for the same reasons. Thus the ultimate JMF Audio transport would be massive, heavy, decoupled and feature top loading. At that point we already forgot about making it relatively affordable... The optical mechanism was then residing on the composite base decoupled with JMF Audio purpose developed cone-ball feet. As I was pointing out the remaining influence of vibrations on optical pick up, my brother Arnaud, mechanical engineer, looked at it and said: I will design a massive block. Needless to say I was a little skeptical. I knew he would manage but I feared the number of prototypes and cost of development since we had to recall aeronautic processes to achieve the desired machining precision. A precision we cannot reach with the machines at our facility. He made it. It is expensive. We approved. Nothing is too good for the music we love. Does the DMT 3.7 also play DVD-Rs with files? (like the Reference Recording HRx) PCM only or DSD too? > The DMT3.7 transport is able to play Blu-ray Audio and data discs containing audio files (on BD-R, DVD-R...). DSD files on BD-R or DVD-R can be played as well. Navigation through data formatted discs is done via a screen or with the provided Android/iOS application. Whereas Blu-ray Audio discs are played seemlessly, screenless, like CDs. If I read correctly, you are firmly behind the PCM camp, right? Why, I mean, what's flawed in SACD format? > DSD (direct stream) to avoid decimation filtering at the ADC and oversampling at the DAC is good at first glance on paper, as ADCs and DACs were supposed to be of a sigma-delta structure at the time of SACD launch. Sigma-delta modulation is referred to one bit quantization with high frequency sampling. However for SACD to reach 120dB of signal to noise ratio in the audio band the modulator is designed to shape the quantization noise over the audio band. It results in very high level uncorrelated noise starting right above 20kHz. Noise at 40kHz can have high magnitudes compared to useful musical signal at 1kHz! SACD were supposed to offer an increased bandwidth, but it is filled with high level noise... Such a noise can have noxious influence on the next analog stages, by intermodulation distortions, making converters and analog circuits deal with high speed signals, saturating tweeter. To reduce the annoyance, SACD players had to feature an analog 50kHz low pass filter... Thus reducing the advantage of an improved impulse response over CDs while still leaving noise between 20kHz and 70kHz at high level... Some manufacturers recalled noise scrambling techniques, which modifies the original signal while rejecting the noise higher in frequency... Another aspect is jitter. With PCM, we have developed means of greatly reducing jitter in a very musical way in the DMT 3.7 transport and in the DXC2.2 MKII DAC. So for now at JMF Audio we take SACD for what it is: a disc with higher definition audio content, and process the stream in multi-bit, reduce the quantization noise, convert as high as 705KHz for best musical rendering. Music for computers allowed DSD x2, x4 to emerge... However it has to be noted that the great majority of studios work on PCM on 24/96kHz, less commonly 192kHz. The benefit from 96kHz to 192kHz is minimal. The industry standards are here. And we like to say that the only important thing is music; we just aim at serving it the best we can. We wish to thank Mr. Wojciech Pacula, High Fidelity Magazine, contributor to Positive Feedback. 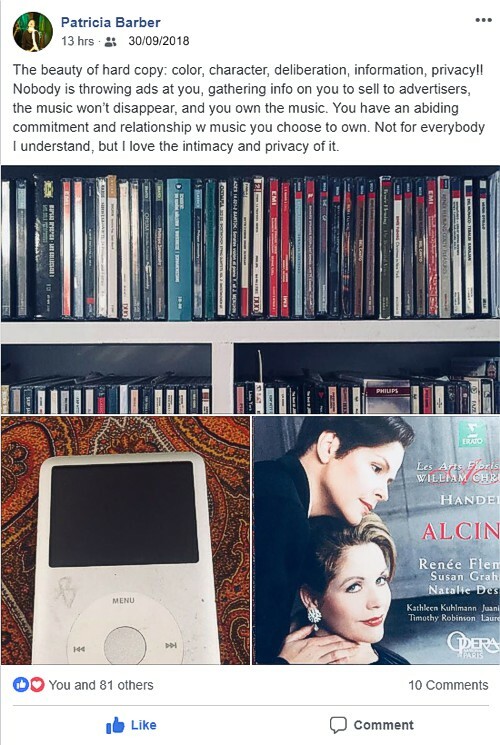 A few hours after we shared this interview, Patricia Barber, the American singer and musician, a reference for many audiophiles and jazz lovers, responded by posting her feelings about music on physical media. "The beauty of hard copy: color, character, deliberation, information, privacy!! Nobody is throwing ads at you, gathering info on you to sell to advertisers, the music won’t disappear, and you own the music. You have an abiding commitment and relationship w music you choose to own. Not for everybody I understand, but I love the intimacy and privacy of it." Grammy Award as of the release on CD, Patricia Barber's "Modern Cool" was recently released on Pure Audio Blu-ray and won another Grammy Award! An excellent hi-res transfer that JMF Audio has played for demonstrations at audiophiles shows in Munich and Hong Kong. Numerous artists share Patricia Barber's opinion. Numerous experienced audiophiles prefer the real.